For any business, a substantial component of systems development and support costs is operating lease payments on the rental of equipment and software. The is particularly true for internet business models which involve major investment in computer hardware and software. An operating lease can be used by the business to rent the equipment and software on a short term basis. The business (referred to as the lessee) pays a periodic rental payment to a finance company (referred to as the lessor). The rental payments do not cover the full cost of the equipment and normally include other services such as equipment maintenance. The rental period is normally significantly shorter than the expected life of the equipment. The asset never belongs to the business and is returned at the end of the lease period. Operating lease payments are treated as an expense of the business and charged to the income statement as part of operating costs normally under a heading such as systems development and support costs. This operating lease payments calculator allows a business to input details of the asset and the terms of the operating lease, and then calculates the amount of the lease payments over the five year term of the business plan financial projection. Enter the asset description, quantity and unit cost. For each asset enter a description of the asset, the quantity of that asset being purchased, and the unit cost. The operating lease calculator works out the total cost of the assets on the operating lease. Enter the start month. Enter the proposed start month for the operating lease. The payments are assumed to be made at the end of each month. For example, if the the number 3 is entered, the first payment on the lease will be at the end of month 3. Enter the operating lease term and interest rate For each operating lease, enter the term of the lease in months, and the implied annual interest rate. 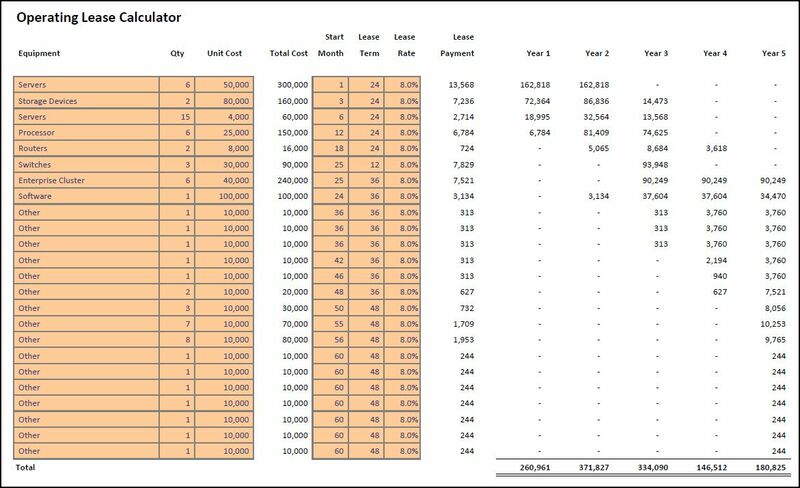 The operating lease calculator works out the monthly lease payment, assuming payments are made at the end of each month, and calculates the payments for each of the next five years for the business plan financial projections. The operating lease spreadsheet is available for download in Excel format by following the link below. Users use this operating lease calculator at their own risk. We make no warranty or representation as to its accuracy and we are covered by the terms of our legal disclaimer, which you are deemed to have read. 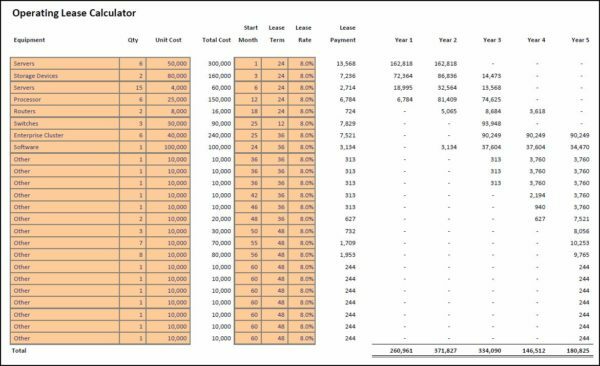 This is an example of an operating lease payment calculator that you might use. It is purely illustrative. This is not intended to reflect general standards or targets for any particular company or sector. If you do spot a mistake in the operating lease calculator excel version, please let us know and we will try to fix it.